The next time you walk into Leo’s, take a quick look around—you might just find yourself sitting next to a United States World Cup player. James Thomas “JT” Marcinkowski spent last summer competing with the U.S. Men’s National U-20 Team in South Korea. Now, the junior goalkeeper is back at school, spending his hours hanging out at the dining hall and training with his teammates on Cooper Field. Although he has quickly become one of the most decorated men’s soccer players in Georgetown’s recent memory, his commitment to the school was anything but guaranteed when the two-year captain was one of the nation’s top recruits in 2013. When recruiting Marcinkowski, the odds were stacked against the Hoyas. Hailing from Alamo, Calif., Marcinkowski was one of the nation’s most highly sought-after recruits in the class of 2015 with a track record that was as lengthy as it was impressive. Despite being separated from Georgetown’s campus by over 2,700 miles, Marcinkowski’s experience caught the attention of the coaching staff. While Georgetown, like most other schools in the country, were keen on recruiting the Californian, they faced a daunting task: convincing him to leave his home state and turn down perennial powerhouse soccer teams such as Stanford University and the University of California, Berkeley. “Dealing with high-end players from California, a lot of the schools—the UCLAs, the Stanfords, the Cals—are going to try to get those kids. And those are great schools and California kids want to go to those schools. So, it’s rare that you get a really top-end California kid even wanting to leave that state,” Wiese said. But the Hoyas had a unique advantage: now-junior defender Peter Schropp. A Nebraska native whose father and uncle previously played at Georgetown, Schropp got to know Marcinkowski when they attended several U.S. Men’s National Team camps together. It was at these camps that the “Nebraska boy and California kid”—as Schropp described them—formed an unlikely friendship. “We weren’t really meant to click, I don’t think. But over the years we had just been spending weeks at a time together every two months or so and we really grew close to one another during those weeks. I was always set on Georgetown and I knew JT was always up in the air,” Schropp said. Marcinkowski said that he wanted to remain as open as possible during the recruiting process, a mindset reflective of his laid back demeanor. However, Schropp’s persistence would pay off when Marcinkowski agreed to visit Georgetown’s campus. “That feeling, as soon as you step on campus, I just knew it was the right place,” Marcinkowski said. “After a day and a half here, when I left, I actually called Peter while I was in the cab on the way back to the airport and I told him, ‘Alright, yeah. We’re doing this.’” Schropp and Marcinkowski later committed to Georgetown on the same day in October 2013. 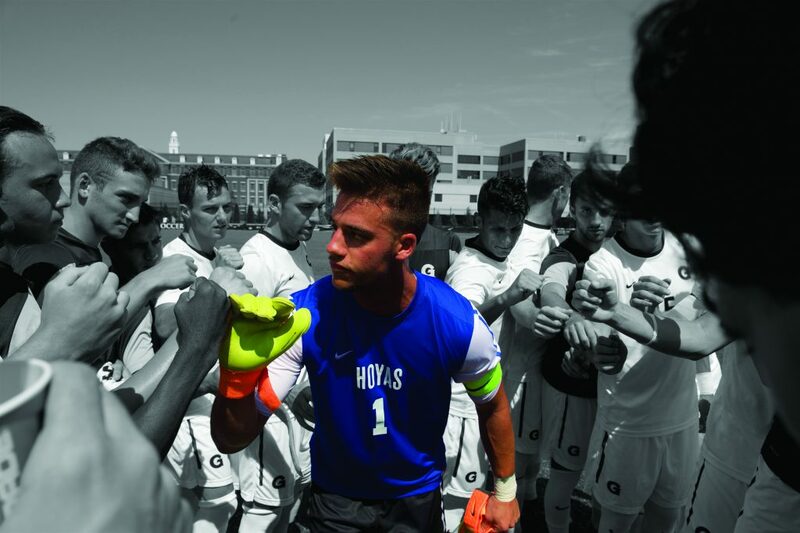 When Marcinkowski arrived on campus to train for the 2015 season, he was greeted by one of the most talented and experienced teams in Georgetown’s history. The team, which entered the season ranked third in the country, started a defensive unit featuring the future No. 2 and No. 3 overall picks in the 2016 Major League Soccer (MLS) draft, Joshua Yaro and Keegan Rosenberry, as well as now-MLS players Cole Seiler and Josh Turnley. Between hanging out off the field and competitive battles on the field, Marcinkowski and the four captains formed a unique bond. Wiese encouraged the veterans to mentor Marcinkowski, who was named a starter prior to the team’s season-opening game. Marcinkowski immediately became a dominant force on the field. The team battled injuries to start the season and went winless through its first three games, despite Marcinkowski allowing just three goals in total. In the team’s fourth game of the season, however, the tide began to turn. In front of 3,000 fans on Shaw Field, Marcinkowski provided a crucial six-save performance, helping the Hoyas upset UCLA, the No.1 team in the country. Marcinkowski’s performance proved to many that he was worthy of the hype that had surrounded him on the recruiting trail. Marcinkowski’s presence in the goal guided the Hoyas to a program-record 18-game undefeated streak, which included a record six-consecutive shutout performances. His performance in the goal became well-documented, securing the titles of Big East Freshman of the Year, First Team All-Big East, and TopDrawerSoccer.com’s Best XI Freshman Goalkeeper. When the entire starting defense left the team for the MLS following the 2015 season, Marcinkowski filled the void by providing incoming players with the same guidance he had received just one year earlier. Wiese and his coaching staff noticed Marcinkowski’s mentorship and named him a captain, a “very rare” honor for a sophomore, according to Wiese.. The team struggled to recreate its 2015 success in 2016, posting a 6-9-2 record. He allowed 1.23 goals per game and managed four shutouts on the season. While the season was not as successful as Marcinkowski or his teammates would have liked, opportunities outside of Georgetown began to arrive for the sophomore goalkeeper. Marcinkowski took the spring 2017 semester off to compete with the National Team in the CONCACAF Championship and the U-20 World Cup. He started one game in the World Cup, allowing only one goal in a 4-1 United States victory. Although training with the USMNT prevented Marcinkowski from training with the Hoyas throughout the spring semester, he returns to the team as a captain for the 2017 season hoping to use his first two years of experience to push the team back into the NCAA Tournament. He was selected as the Preseason Big East Goalkeeper of the Year and earned a spot on the Preseason All-Big East team. As Marcinkowski enters the season surrounded by palpable buzz, his easygoing personality remains unchanged. Marcinkowski opened the season with a three-save shutout on the road against local rival American University, helping Georgetown secure a 2-0 victory—the team’s first season-opening win since 2012. Two days later, he added a two-save shutout and another victory against No. 19 Coastal Carolina. The Hoyas were picked to finish fifth in the Big East in the conference’s Preseason Coaches Poll, but Marcinkowski remains hopeful that the team can outperform this projection. Marcinkowski’s path to Georgetown was a unique one. But according to Wiese, his talent on the pitch and leadership capabilities are even more uncommon. As the third-year starter and second-year captain continues to impress teams both at home and abroad, it is clear to many that Marcinkowski has a future in soccer’s professional ranks. For his coach, Marcinkowski’s continued dedication and hard work remain enduring parts of a legacy that will extend far beyond his years on the Hilltop. “All of the young guys are thinking, ‘Well, he’s playing at the international level and he’s probably going to be a pro.’ They’ll look at him and they’ll think, ‘Oh, that’s what I need to do to get there. That’s the mentality I need,’” Wiese said. Marcinkowski is a dominant force on the field for the Hoyas, but his impact might best be measured by his ability to guide the future of the team, both on and off the field, as teammates of years past once did for him. Tyler Pearre Maryland native and D.C. sports fan. Forever romanticizing the days of Antawn Jamison and Gilbert Arenas circa 2007.